Many people believe that declawing their cat is the surgical removal of the cat's nails. This is incorrect. Before making the decision to have your cat declawed be aware that there may be an alternative to declawing. Declawing a cat is a procedure that is mostly done in the United States, and most owners are not aware of what declawing is. In England, declawing is considered "inhumane" and an "unnecessary mutilation." In fact, declawing is illegal or considered inhumane in many countries throughout the world, including over 12 European nations, Australia and Brazil. 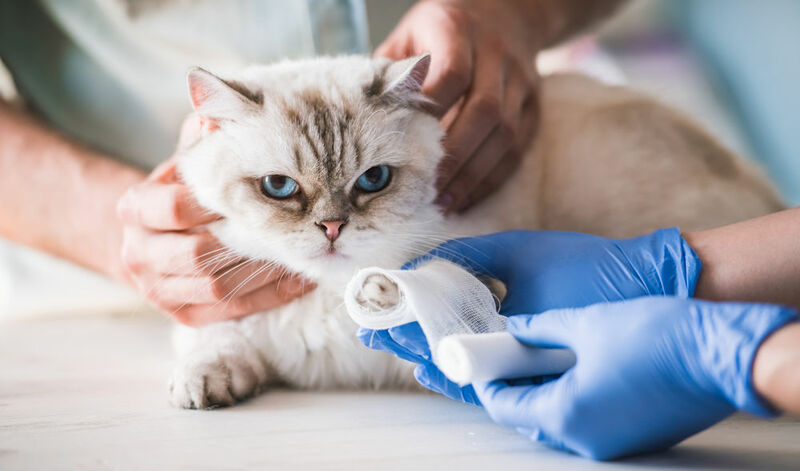 Nowadays, many veterinarian practices in the United States, will not declaw a cat, and some veterinarians put age restrictions as to when declaw surgery can take place as some older cats that are declawed have adverse personality changes. A cat's claw adheres to the bone – so closely adhered to the bone, that to declaw the cat, the last bone of the cat's claw has to be removed! Declawing is an amputation of the last joint of the cat's "toe." Liken this to having your finger amputated to the last joint. Most veterinarians that do perform declaws will only do so when a cat is under one-year old because after this age it can be difficult on the cat for a number of reasons. Longer recovery time and there is significant evidence of adverse changes to the cat's personality (i.e., behavioral changes, litter box issues, aggression). Declawing is a painful surgery and during the recovery period, the cat still has to use its feet to walk, jump, and scratch in its litter box regardless of the pain it is experiencing. All of this is why most veterinarians insist that the younger cats tolerate this procedure better than the older ones and most often combine this surgery with the spay/neuter procedure. A cat is designed for grace and agility. Its claws are an important part of that design – for climbing, for holding onto prey, and for defense (the back claws). Amputation of their claws deprives a cat of its primary means of defense – which means leaving the cat prey to predators if the cat were ever to get loose by accident and escape outdoors. Scratching posts – Not all cats instinctively know how to use a scratching post. However, you can teach a cat to use one. Gently place the cat's front paws on the cat post and simulate the scratching motion several times on the post. Do this a few times a day and after you do this, immediately give the cat a favorite treat or toy along with praise. The best scratching post is the kind that has the "sisal rope" that is wrapped around a tube. The carpeted posts often encourage the cat to scratch your carpet. "Cat Scratching Solutions" provides many solutions as well as insight into the psychology of why cats scratch. Keep the cat's claws trimmed short, (which you should do anyway, regardless if you use a scratching post or not). Soft Paws® - - Soft Paws® are lightweight, vinyl nail caps that are glued on the cat's front claws. They are available in clear and a rainbow of colors (in case you want to play beauty parlor). These are a great solution for those people who are not home much and do not have the time necessary to teach a cat to use a scratching post. Soft Paws® are easy to apply and last about 4-6 weeks until the nail grows out, and then you apply a new set. (800) 989-2542. Don't declaw! Don't make declawing your first choice it should always be the last resort. Understand your cat's need to scratch. Forget punishment--it doesn't work. In fact, if you try to physically punish your cat it may backfire on you, and the cat will start "showing" you their displeasure (i.e., urinating on your pillow) or they may start biting you and others. Provide a suitable place for your cat to scratch. Make the place your cat or kitten has been scratching unattractive (i.e., using a physical or scent related deterrent). Physical deterrent means a spray bottle with water in it to startle the cat when it is IN the act of scratching an inappropriate item. Scents - most cats do not like the smell of citrus products, so put lemon or orange scented items on the areas you do not wish your cat to scratch. When possible, start cats young and show them the correct place to scratch and mark their territory. For indoor cats, consider Soft Paws® as an easy alternative. Below is a video that demonstrates what can go wrong in a declaw. While it depicts a large lion that has been declawed as a young cub, it is still pertinent as it is a feline. The Paw Project (2012) - Official Trailer. Video used with permission of The Paw Project organization. All rights reserved.